Frank Sinatra was “The Chairman of the Board”, Springsteen is “The Boss”, Elvis was “The King” and Gary Sinise is now, and most likely will forever be, “The Lieutenant”. Throughout Sinise’s long and distinguished career as a celebrated actor of both stage and screen, the role that seems to have resonated the deepest is that of Lt. Dan in the Academy Award winning Best Picture Forrest Gump. Sinise received rave reviews for his portrayal of the contentious Viet Nam veteran with a heart of gold and was nominated that year for an Oscar for Best Supporting Actor in a Motion Picture. 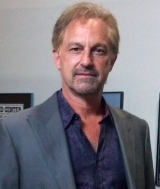 The role established Gary Sinise as an actor of depth and substance in Hollywood- something he had already proven many times over on stage in both Chicago and New York with the theatre group he co-founded, Chicago’s world famous The Steppenwolf Theatre Company. In the years since, Gary Sinise has won the Cable Ace, SAG and Emmy Award for his performance in HBO’s George Wallace and the Golden Globe for his brilliant work in the HBO film Truman. In 1991 Sinise directed and co-starred with fellow Steppenwolf Company member John Malkovich in the big screen adaptation of John Steinbeck’s Of Mice and Men. A few of Sinise’s other notable performances include Apollo 13, The Green Mile, Ransom, All the Rage (a personal fav of mine, seek it out! 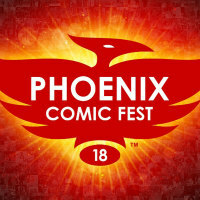 ), That Championship Season and the ABC Mini-series Stephen King’s The Stand. 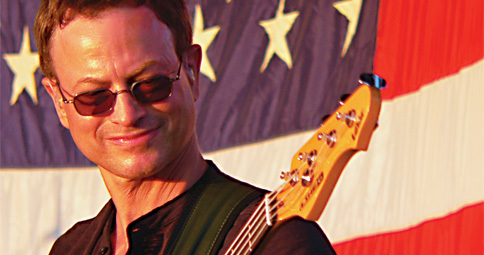 These days Gary Sinise can be seen every Friday night as Mac Taylor on CBS’ CSI:NY, which will begin it’s 8th season this Fall and, in his off time, on a bandstand somewhere in the middle of Afghanistan or Iraq. 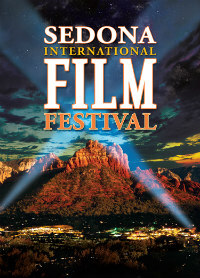 Personally, I’ve been a big fan of this flick since I first saw it earlier this year at the Sedona International Film Festival. The movie is a true labor of patriotic love. It’s a celebration, a call to arms and a tribute to the many who live and die to defend our freedom and liberties. It’s also got a great beat and you can dance to it, (and I strongly recommend you do)! 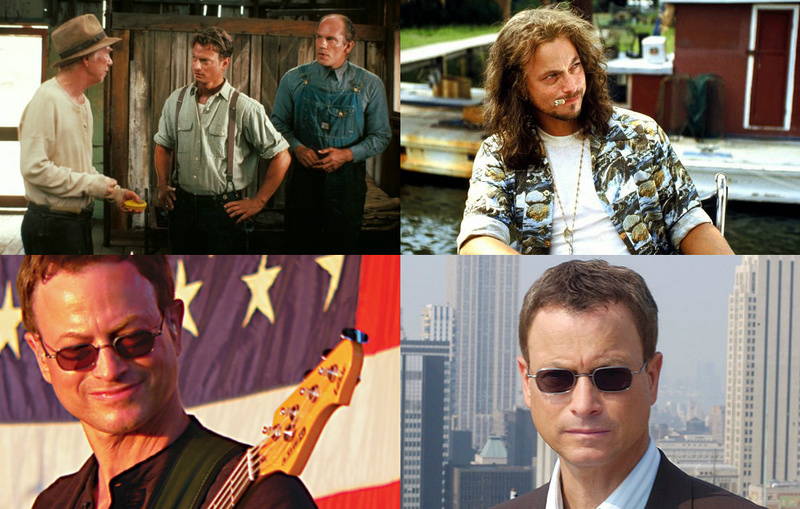 Recently, I had a chance to talk with Gary Sinise about Lt. Dan Band: For the Common Good, as well as his long and varied career on both the stage and screen. Pop Bitez: What’s the one thing you want people to take away from your new film Lt.Dan Band: For the Common Good? Gary Sinise: Well, through this work I’m doing you get introduced to a lot of people who are doing good work out there and if people are inspired by some of these folks, and also some of the wonderful defenders you meet in the film, that’s a good thing. I hope people enjoy the film because of the people who occupy the film, I was just pleased to be a part of it and to have Jonathan follow me around a little bit to see what I’m up to. PB: Now, for those people that know you mostly for your work on the big and small screen, the Lt. Dan Band may be a bit of a surprise but, for those who know you from your many years on the stage as a founding member of Chicago’s world famous Steppenwolf Theatre, Rock and Roll, it would seem, has always been a part of your creative life, in fact the term “Rock and Roll” has actually been used many times by critics as a way of describing more than a few productions at Steppenwolf, do you remember how old you were when you first discovered rock and roll? GS: However old you are in fourth grade, that’s when I got my first guitar and that’s when I started listening to The Beatles and The Beach Boys and started wanting to perform. Through Jr. high school and high school and up into my early twenties I was always playing in bands and then, in high school, not only was I performing in bands but I got hooked on acting and started performing in plays, so I was going back and forth between music and theatre. When I graduated from high school I started the Steppenwolf Company with some pals and the acting sort of just took over and I didn’t really play for quite a long time, it was the late 90s when I started playing again. PB: And as far as your instrument of choice is concerned, was it Paul McCartney or more John Paul Jones? Why the bass? GS: Because the other guitar players were better and we needed a bass player (laughs) yeah, that was kind of it. I was playing guitar and we ran into another guitar player who was just much better than I was and we needed a bass player so I ended up playing bass and then I played bass in a jazz group when I was 19,20, 21 years old, I was playing in a jazz quartet and I really got into bass but, you know, I was never a really great bass player and I realized at that point that the discipline it takes to be a great musician… I didn’t have it, with acting you can kind of rely on your intuitive skills a lot more, playing music…you can have instincts for it but it’s also very technical, you have to practice and practice and practice to be able to get your fingers movin’ and all that, I just didn’t have the discipline to become a great bass player but I’m a good bass player and I can certainly play all the stuff we need to play to entertain the troops and the families out there. PB: I think one of the reasons you’ve always been one of my favorite actors is your dedication and passion for telling stories that deal directly with the American experience, from Tom Joad in The Grapes of Wrath and George Milton in Of Mice and Men to George Wallace, Truman, Apollo 13 and Forrest Gump, I’m curious to know, are you consciously pursuing these stories or are they, more or less, pursuing you? GS: Well, I think I’m just drawn to American stories. I fell in love with Steinbeck in the 70s when I was in high school, through Of Mice and Men I became a Steinbeck fan, and then I ended up being in a play Of Mice and Men and then doin’ a movie of it and then doing The Grapes of Wrath, I guess I’m just drawn to American stories because that’s just who I am. PB: I actually don’t think I’ve ever seen you do any “accent work”. GS: Well, I’ve done some Pinter plays, we did a lot of Harold Pinter and that kind of stuff in the 70s and early 80s in the theatre, but…I’m not a guy who’s done a lot of Shakespeare. PB: Beyond your USO tours you’re also the national spokesman for the American Veterans Disabled for Life Memorial and the co-founder of Operation Iraqi Children, to name but a few. You’ve sited the horrific events of 9/11 as a primary motivating factor but I can’t help but think the actual roots for your passionate commitment to our troops and first responders predates that event, you actually touch on that a bit in the documentary, your family history was a big influence as well, right? GS: Absolutely, I’ve got veterans in my family, on both my wife’s and my side and I got involved with Viet Nam veterans groups in the early 80s in the Chicago area ( by way of Steppenwolf’s award winning production of the play Tracers) and then I played a Viet Nam veteran in Forrest Gump and I got involved with a disabled American veterans organization and it’s just built up over time and then, you know, when September 11th hit I was just grieving and I just felt a need, I had to get involved, I had to be where I could be of service and I thought entertaining and visiting and supporting and showing up for our firefighters, our police officers, our military service members, our wounded warriors, our disabled veterans, our Viet Nam veterans and people who have served and done a lot in sacrifice for this country, that’s where I could be of service and where I could make a difference. Over the years I’ve done a lot of that and the more I do it the more I get involved with different organizations, that’s why I created the Gary Sinise Foundation which is set up to help me do more because I’m only one guy, I can only go so many places and raise so much money by showing up to something, you know, there’s got to be other ways that I can continue to evolve and expand without it always being dependent on the minute to minute physical presence of me showing up somewhere. PB: I’m currently following you on Twitter and Facebook and, from your posts and tweets, I get an overview of what your schedule is actually like and, I gotta tell you, you would make the busiest person feel lazy. GS: (laughing) Well, yeah, look, I’m lucky, I’m blessed. I don’t pretend I don’t get a lot out of this, I get a great reward in knowing that what I can contribute is actually going to be helpful and make a difference in somebody’s life. Whether it’s performing with a band or visiting a hospital or attending a Gold Star event or trying to help the children or whatever it is, there’s a great reward in service and giving back and I get a lot out of it because I know that it does make a difference and if me making a difference in our defenders lives can help keep our country strong then that’s a way I can serve. This is a dangerous world out there and we felt it all too clearly on September 11th when we were attacked and everybody was just driving around in a coma, remember? People were living in fear and wondering “what’s gonna happen” and then all of the sudden, a few weeks later we’re getting Anthrax in the mail and, you know, we’re under attack and it’s like “what’s going on?” and “what is the future of our country?”… and I started thinking that, what IS the future of our country? How vulnerable are we? We see now, in many ways we’re VERY vulnerable and if we don’t stand up to preserve what we have…in various ways…simply by helping our communities out or by teaching our children properly or helping our defenders or by saving our money…or spending more, whatever it is…this is our country and we have to take care of it. You go around the world and you see how other countries operate and what they don’t have or how the dictatorships have oppressed the people and you start to value the freedom and liberty that we have enjoyed in this country but you also start to think, well, gosh, what if that was taken away one day? What if we weren’t as free as possible? What if we couldn’t do everything that we dream of? You know, I don’t think we’d like it and I’m just looking out and helping out where I can, you know, I think of my kids and my grandkids and what world they might live in and I want them to enjoy a strong country and a country that continues to provide security and freedom to it’s citizens. PB: I’m sure I’m not the first person that’s said this to you but, although I would miss you as an actor, I’d vote for you in a heartbeat. GS: (laughs) Yeah, well, I don’t know, I can play some politicians on T.V. but I don’t know if I’d like to be one. PB: Fair enough, speaking of T.V. you’re starting work on season eight of CSI: NY in a few days, is that right? GS: Yeah, we’re lucky, we got another season, thank the audience out there for watching us. You know, eight seasons of a television series is a pretty great thing and it’s been a wonderful thing to have at a time in my life when I’m trying to do so many other things, just not having to worry about “the job”, which so many actors have to worry about, you know, you start one job and you’re already thinking, “well, this one is going to be over in two months, what am I gonna do next?” and when you have a successful television series that part of the actor equation is taken away, I’ve never enjoyed that before. I’ve been the artistic director of a theater company and had a steady job for a long time but as an actor it’s up and down and project to project and this has been a wonderful job to have when I’m trying to do so many other things. PB: And how do you keep Mac Taylor fresh for yourself after 8 years? GS: You know what? It’s an enjoyable job and I enjoy having this steady job. I’m all too aware of how other people live out there, that can put everything into really good perspective for you, so it’s not hard to keep it “fresh”, just the fact that you’ve got it is “fresh” enough (laughing). I have a very lucrative job on a television series while there are, you know, miners in the coal mines diggin’ around and they don’t make half as much, so look, it’s not hard to keep it “fresh”, I’m happy to do it and that keeps it “fresh” enough. PB: Given your background do you ever find yourself missing the immediacy of the stage? GS: Yeah, occasionally, yesterday morning I was at Steppenwolf, I was in Chicago over the weekend… we played at Great Lakes Naval Base, we played a big “Rockin’ for the Troops” show that we do out in Wheaton, Illinois and then yesterday morning, before the Cub game…I sang “Take Me Out to the Ball Game” at the Cub game yesterday….and right before the game I went over to the Steppenwolf and gave a little tour to some people and, you know, going on the stage and everything, it makes me a little homesick for that, but I know I’ll be able to do it sometime if I want too. The Steppenwolf was created and survived many, many challenges over the years and is now very strong, very solid and having founded that theater, you know, hopefully they’ll have me back at some point and I’ll be able to do some work there. PB: I really want to thank you for taking the time to talk with me today, Gary. GS: It was my pleasure Scott, thank you. Wonderful interview. Thank you very much. Such a remarkable man, and, for a Hollywood celebrity, humble too! Love this guy.